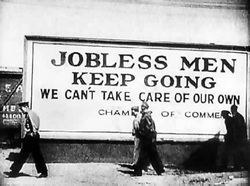 The Great Depression was a time of economic downturn following the stock market crash of 1929. Many people had been working with stocks to make money before the crash and were greatly affected. There was little work, little pay, it was a very hard time for the people. Franklin D. Roosevelt put plans in place in an effort to bring help people.